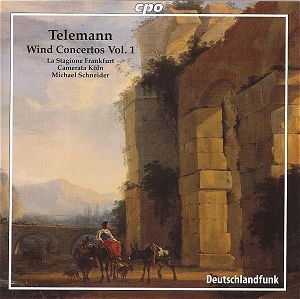 This is a very pleasing CD and only the first volume of a complete edition of Telemann's wind concertos. The music is lively, varied, interesting, striking; and it’s played by La Stagione Frankfurt and Camerata Köln under Michael Schneider with a full awareness of and enthusiasm for those characteristics. Telemann is one of those composers who surprises: when you think you have his measure, you listen to music like that on this disc; and it forcefully shows fresh invention, different ideas and untried approaches. Although he cut his musical teeth on keyboard, strings and recorder, Telemann held it a point of honour not only thoroughly to familiarise himself with the broadest spectrum of instruments that was then in common - and not so common - use; but also to write distinctive and convincing music for them. Here we have concertos for horn, oboe, transverse flute and recorder. What’s striking, though, about this strand of the composer’s work is the degree to which Telemann understood the acoustic characteristics of each of these instruments so well. He was able not only to exploit these, but also to say something new - yet not falsely novel - in terms of repertoire and compositional integrity. These musicians bring this out. They do not treat Telemann’s wind concertos as curios, or ‘test pieces’. He worked on these concertos from his time as Konzertmeister at Eisenach from 1708 through to the mid-1730s when he was Kantor in Hamburg - but published only a few isolated examples after his Tafelmusik of 1733. Dating his over a hundred concertos is difficult. The horn double concerto (TWV 52:D2) and the oboe one (TWV 51:d1) are likely to have been composed between 1708 and 1714 - so are early. They contain more shorter, contrasting, elements reflecting the canzona style with much interplay between solo instruments and ripieno strings. Both the recorder and transverse flute double concerto (TWV 52:e1) and the E major one for transverse flute (TWV 51:E1) are likely to have been written in Telemann’s late Frankfurt years. They are more expansive and build on an expanded cyclical structure. The concerto for recorder and two violins (TWV 43:g3), however, is closer in form to the typical eighteenth century sonata – and also recalls the Suite form. This blurred distinction was especially appealing to Telemann, as can be seen by the thematic and textural exuberance to which the performers here live up so well. These five concertos sit well together on the same CD: the variety is refreshing and stimulating and makes for very satisfying listening from first note to last. Within each work, there is contrast as well. They have, for example, a four (or five) movement structure – usually slow-fast-slow-fast. This offers opportunities to expose the cantabile characteristics of the instruments first, as opposed to the virtuosic. It would be hard to fault any of the playing … enthusiastic, lively, respectful of Telemann’s interest in the match between sound and idea. And with full attention paid to dynamics and expression. The strings in each case seem as earnest as the soloists are to jump in and make a splash. Yet not in a flashy or ephemeral way. This is accomplished, reflective and mature playing and makes the CD one to buy without hesitation. The recording is first class; clear and sparkling. The booklet, while a little rough around the translation edges, is informative. So this CPO series looks like an admirable enterprise and one which promises to bring us much original and pleasing music, well played and presented. Definitely one to consider carefully if you wish to examine the strengths of Telemann – and his surprises.